District 9 Supervisor Hillary Ronen is asking Washington to extend its protection of migrants who cannot return to their countries of origin because of war or natural disasters, but who don’t have refugee status. At Tuesday’s Board of Supervisors meeting, Ronen introduced a resolution that calls on the Federal Government to extend the Temporary Protected Status program for people from 10 nations designated under the program. The Trump administration recently announced that the program will end in January for Haitian nationals. Immigrant advocates fear other countries — including El Salvador, Honduras and Nicaragua — will be included in the cancellation. 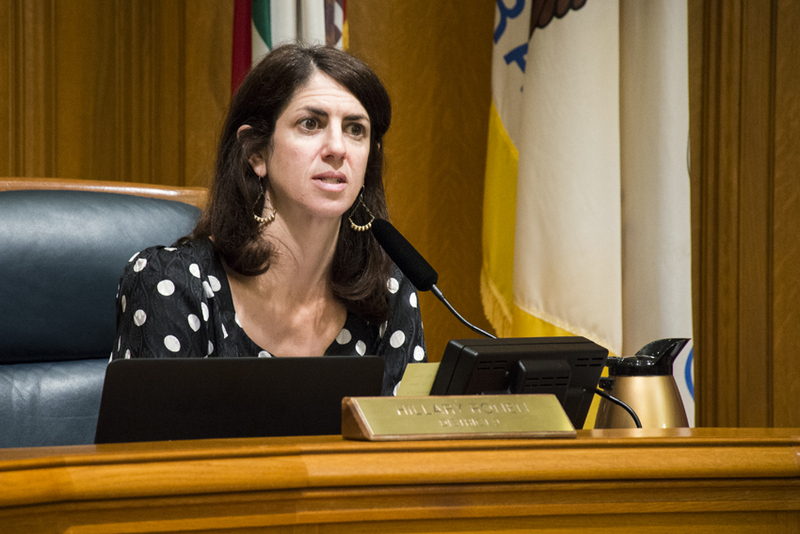 Ronen proposed her resolution in anticipation of the potential cancellation as a way to reassure the many residents of San Francisco who have Temporary Protected Status. “Now, more than ever, it is critical that we stand with our immigrant neighbors and fight back against inhumane federal policies,” Ronen said in a statement. Temporary Protected Status provides relief from deportation and work permits for migrants who don’t meet the legal definition of a refugee but who can’t return to their countries because of crises like war or natural disasters. It protects 55,000 people in California and 350,000 people nationwide. One of them is Yanira Arias, who worked as a journalist in San Salvador, El Salvador, in the late 1990s and suffered harassment and threats of violence as a woman and because of her sexual orientation. “The impact of ongoing violence and criminal activity, and mostly harassment toward women in the area, of LGBT women, basically that’s the reason that I faced more than one incident in which I needed to fight back in order to [get] out of the situation, and there were many verbal and many physically dangerous situations,” Arias said. Arias made her way to the United States in 2000, and is now an advocate with the group Alianza Americas, working in the Mission through the Central American Resource Center, or CARECEN. She said the proposed resolution would send a strong message — not just to the federal government but, more important, to those living in San Francisco with Temporary Protected Status. “The resolution is very important, it’s very significant, it’s a statement. That statement of being welcomed by an entire city and City Hall makes a difference when an administration is going the wrong way,” Arias said. Just a year after she moved here, Arias’ home country was hit by a series of earthquakes, further complicating any possibility of return. At 45, Arias would face the potential for the same kind of harassment that drove her out of El Salvador, as well as limited economic opportunity, if she were forced to return. “The bottom line is that these regressive and damaging federal actions and policies make no sense,” Lariza Dugan Cuadra, executive director CARECEN of Northern California, said in a statement. “We will continue to push back, organize and advocate for policies that are responsive to our communities’ needs,” Dugan Cuadra said. No doubt noble intentions but to who or what agency is this addressed? Just curiosity on the part of a long time resident and voter. Is this another meaningless resolution on the part of a supervisor where meaningless resolutions are a time honored tradition? Is there any support behind the request, such as big city mayors? How about our mayor? Will he return unsigned, or does this make a good photo op? Are any of our Senators or Congressional representatives in support, or even aware? Will they bring it up in committee? Have you asked? Any chance it would be heard in a Republican controlled Congress? Is this merely another step in the sanctuary city saga that has left San Francisco a laughingstock in many circles? (Believe it, sorry) Will this elicit belly laughs among Repubs, even those in California? What’s the upshot here? By the way: how many shootings in the Mission this week, Hillary? How many strong-armed robberies? How many assaults? How many car break-ins? I want to hear that you’re doing everything in your power to support and welcome our new Captain at Mission Station. That’s what I want to know about. What’s new on your part? How many other empty resolutions have you been a part of recently? Any progress on our homeless encampments? The rains will be here soon.